Enjoy the healing rhythms of drums, percussion and sounds of nature. Throughout human history constant repetitive rhythms have carried shamans and other spiritual seekers into other dimensions in ecstatic trance. Reach a higher state of well being. Enjoy the healing rhythms of drums, percussion and sounds of nature. Throughout human history constant repetitive rhythms have carried shamans and other spiritual seekers into other dimensions in ecstatic trance. Even today, this music, provides transport to higher states of wellbeing. Discover the journey of the Shaman's Dream. Feel the pulsating beat. Hear the Rain, Wind, and Coyote's call. Fly with the Eagle. Meditate in the Quiet Thunder. Slip into the Dancing Shadows. Experience the Heart of Darkness and your Vision Quest. Open to the light with the Sun Dancer. Be one with Eye Nature. 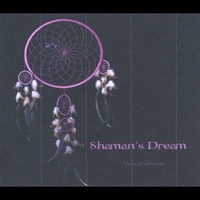 Shaman's Dream is here waiting for you to open your mind, ears, and heart.